ELSEWEDY ELECTRIC S.A.E. (EGX: SWDY.CA), the leading Integrated Energy and Infrastructure Solution Provider in the Middle East and Africa, in a Consortium with MITSUBISHI HITACHI POWER SYSTEMS, LIMITED (MHPS), announces SHARJAH ELECTRICITY AND WATER AUTHORITY (SEWA) award for the EPC contract of AL LAYYAH Combined Cycle Power Plant in SHARJAH, UNITED ARAB EMIRATES, with a value of approx. 550 million USD. The 1,026.3 megawatt gas-fired combined cycle power project is located in Al Layyah in the Emirate of Sharjah and shall start producing energy by 2020. The power plant will consist of one power block made by MHPS contains two M701F gas turbines, two heat recovery steam generators, one steam turbine, and three generators. ELSEWEDY ELECTRIC’s scope of work, representing approx. 65% of the Project Works, includes engineering, procurement and installation of balance of plant in addition to the erection and installation of the MHPS gas & steam turbines. In addition, ELSEWEDY ELECTRIC will be responsible for the site preparation, levelling and the civil, construction and site utilities for the Project. Demolish and relocation work is also included within the existing Al Layyah power station. Water structure with off-shore works is also managed by ELSEWEDY ELECTRIC. MHPS scope of works includes fabrication, supply, testing and commissioning of the power block equipment in addition to joint Project management. The Project features the first EPC-plus-Finance project in UAE utilities power market. Japan’s export credit agency, The Japan Bank for International Cooperation (JBIC) signed yesterday, 28th of March 2019, a buyer's credit agreement (export loan) with SEWA for the Project which is co-financed by Société Générale, Tokyo Branch (lead arranger); ING Bank, a branch of ING-DiBa AG; and Standard Chartered Bank, Tokyo Branch. The co-financed portion will be covered by insurance from Japan’s Nippon Export and Investment Insurance (NEXI). SEWA currently operates 2,850 MW power plants in Sharjah fired by natural gas and oil. In addition to supplying electric power, the plant uses the steam created on-site to convert seawater to fresh water, which SEWA supplies within the emirate of Sharjah. In response to an increasingly tight power supply due to Sharjah’s economic development, SEWA has embarked on a program to increase power output and boost efficiency through adoption of state-of-the-art and highly efficient power generation facilities, and expansion of the Al Layyah power plant is part of this initiative. “Being awarded the EPC contract of AL LAYYAH combined cycle power project with SHARJAH ELECTRICITY AND WATER AUTHORITY in Sharjah following the last year award of the EPC contract of AL AWEER “H” station phase IV power plant with DUBAI ELECTRICITY AND WATER AUTHORITY in Dubai proves capabilities, trust and competitiveness that we built in the United Arab Emirates”, commented Ahmed Elsewedy, President and CEO of ELSEWEDY ELECTRIC S.A.E. 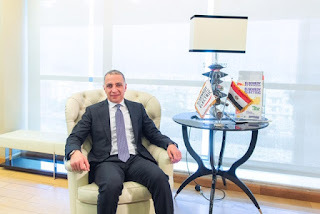 ELSEWEDY as EPC main contractor in power generation, independently and in consortiums, has over the last five years successfully connected more than 7,500 megawatts of conventional and renewable energies to the energy infrastructures of EGYPT, Middle East & Africa. ELSEWEDY ELECTRIC also has currently another 2,930 megawatts power projects under construction in UAE and Africa. Furthermore, it has constructed more than 10,000 kilometres of overhead transmission lines and numerous substations equipping several countries in the region with high voltage and ultra-high voltage transmission systems.